We went on a grocery run to Trader Joe’s last night. They have such an amazing selection of cheeses at a bargain, so every time we go, we buy a kind we haven’t tried before. So far we’ve have loved every single one we’ve tried. The Smoked Gouda is one of our favorites (you can see it in this post). Their Toscano cheeses are amazing (they have one coated in black pepper and one soaked in Syrah). The Unexpected Cheddar is a crumbly cheese with bits of Parmesan mixed into the white cheddar. Lance’s favorite is the Red Leicester with Chili and Red Bell Pepper, which is a mix of sweet and spicy. I think my favorite so far has been the English Farmhouse Cheddar with Caramelized Onions (it was amazing in this salad, but also perfect for snacking with crackers). 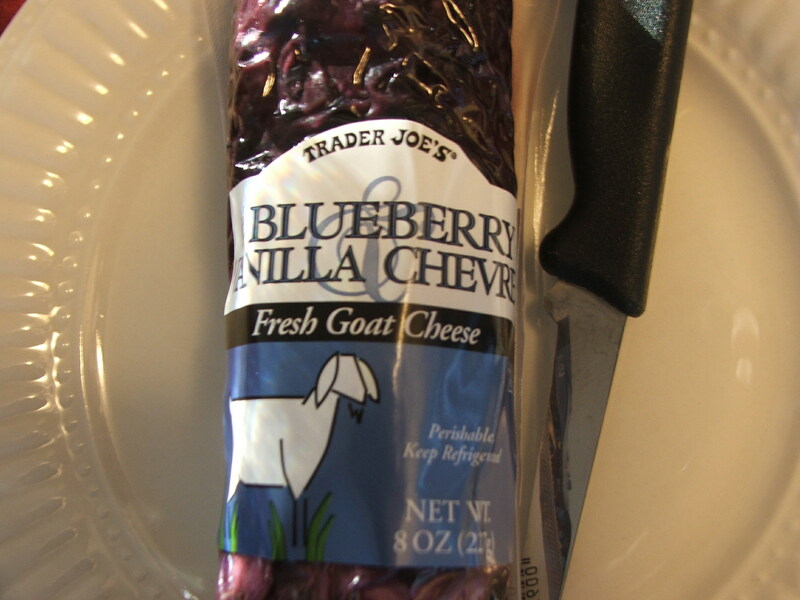 Last night we tried two new varieties – Blueberry & Vanilla Chevre Goat Cheese and Creamy Danish Havarti. For dinner we snacked on a plate with these two cheeses, Kalamata olives, Italian salame, “More Than a Mouthful Trek Mix”, olive tapenade, Raisin Rosemary Crisps, and Fig & Olive Crisps. Both cheeses were fantastic – the Blueberry Chevre tasted like it should be a dessert. And the Havarti is a nice basic cheese that would pair with anything. The Raisin Rosemary crisps are my go-to cracker at Trader Joe’s (I found a recipe for them in this post). The Fig & Olive crisps were a bit chewier – still nice flavor, but I like the Raisin Rosemary better. The Trek Mix is a blend of dried cranberries, dark chocolate sea salt & Turbinado sugar almonds, pumpkin seeds, and Greek yogurt coated pretzels. 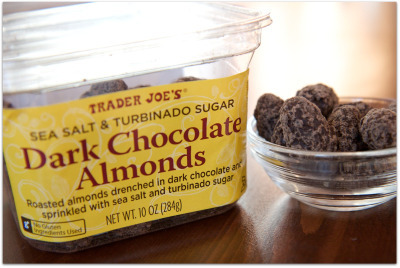 It was very good, but I think I’ll stick with just buying the dark chocolate almonds since they're the best part of the mix. The sea salt & Turbinado sugar are a perfect sweet & salty combo - they are one of my favorite sweet treats. We buy the salame almost every time we go – the peppered kind is my favorite. We also bought fresh garlic & herb pizza dough and Creamy Tomato Basil Pasta Sauce on this trip, so we're planning to use the rest of the salame as a pizza topping. I love that we can go to Trader Joe’s and make several impulse buys, and yet the total bill always ends up being much lower than I anticipate. It’s like getting Whole Foods or Fresh Market quality foods for Publix prices. So happy we have a Tampa location now! They’ve been spreading quickly, with 15 open or soon-to-open Florida locations. Trader Joe’s Tampa is located at 3808 W Swann Ave, Tampa, FL 33609 and is open 8am – 9pm every day.